NASA Press Kit for Space Shuttle Mission 43.
however, for radar tracking and backup communications. Launch Pad 39-A. On board Atlantis, planned to land about 9:30 a.m. EDT Aug.
specialists Shannon Lucid, G. David Low and James C. Adamson. experiment that uses fiber optics for communications onboard the Shuttle. Kennedy as a planned landing site, dependent on weather. 72 degrees west longitude; frequency 3960.0 MHz, audio 6.8 MHz. Huntsville, Ala.; Johnson Space Center; and NASA Headquarters, Washington, D.C.
202/755-1788. This service is updated daily at noon ET. landing operations will be produced by the appropriate NASA newscenter. occur at approximately 8-hour intervals. Primary Landing Sites: Kennedy Space Center, Fla.
Edwards Air Force Base, Ca. Return to Launch Site - Kennedy Space Center, Fla.
Sands Space Harbor (Northrup Strip), NM. accomplished since return to flight. 2028 is in the No. 3 position. These engines were installed in May. of the orbiter and anything that is unique to the STS-43 mission. was delivered from Cape Canaveral Air Force Station to the VPF on April 26.
electrical connections between the two flight elements, was finished on May 22.
with the payload, was complete on June 7.
are scheduled for closure 2 days before flight. launch countdown dress rehearsal was scheduled for July 3 at KSC. tanks will be loaded and all orbiter systems will be prepared for flight. begin taking their assigned seats in the crew cabin. above will deternine whether the Shuttle lands at KSC or DFRF. as TDRS-4 in orbit, was launched from Discovery on March 13, 1989 on STS-29. 2. Deploy space-ground link boom. 4. Separation of IUS and TDRS. 5. Release single access booms. 6. Position single access antennas. 7. Open single access antennas. antennas pointing constantly at the Earth while the solar arrays track the sun. spacecraft and the ground terminal and vice versa without processing. megabits per second) from both the East and West locations. the Johnson Space Center in Houston. system which provides operational communications support to all NASA projects. compartments on the back of the single-access antennas. in two axes directing the radio beam to orbiting user spacecraft below. provided both users are within the beam width of the antenna. to and from the ground terminal at Ku-band. conducted by Contel Federal Systems and Bendix Field Engineering. begin preliminary design of the IUS. reliability, low cost and safety. reliability of better than 98 percent. and deployment from the orbiter. communication conduits between the IUS and/or satellite and the orbiter. is made by aluminum skin-stringer construction, with longerons and ring frames. multilayer insulation blanket across the interface between the IUS and TDRS. stations, as well as electrical power distribution. Attitude is compared with guidance commands to generate error signals. vehicle's altitude or to maneuver the vehicle. connector for all mission phases from prelaunch to spacecraft separation. or contamination after the spacecraft separates. transfer of heat across the connecting points. to prevent electrostatic charge buildup. are normally performed at this time. IUS and its payload can be restowed. for IUS/TDRS deployment is sent to the crew. the shadow of the orbiter or in Earth eclipse. engines are ignited to move the orbiter away from the IUS/spacecraft. At this point, the IUS/TDRS is controlled by the IUS onboard computers. injection through spacecraft separation and IUS deactivation. performs any maneuvers needed by TDRS for thermal protection or communications. collision/contamination avoidance maneuver before deactivating. "blocks out" the Merritt Island antennas. (EAST) satellite acquires the Shuttle. Administration's NOAA-9 and NOAA-11 satellites and NASA's Nimbus-7 satellite. accurate readings possible for the detection of atmospheric ozone trends. coincidences can occur 17 times a day. incoming radiation to the amount backscattered by the atmosphere. measurements across a full 11-year solar cycle. support canister contains the power system, data storage and command decoders. The dedicated power system can operate the SSBUV for approximately 40 hours. is managed by GSFC for NASA's Office of Space Science and Applications. series of experiments leading toward major benefits in biomedical technology. study the protein's molecular architechture. enhance the protein's normal function within the body or other organisms. and greatly reduces the time required for the analysis of protein structure. space-grown crystals are much larger than their Earth-grown counterparts. University of Alabama-Birmingham, is lead investigator for the PCG experiment. Dr. Lawrence J. DeLucas, Associate Director and Chief Scientist, and Dr.
mission will provide additional data on the polymer precipitation process. desalination of water and kidney dialysis. precipitate the membrane from the solution and complete the process. manager for IPMP. Dr. Vince McGinness of Battelle is principal investigator. Center, Houston, and Ames Research Center, Mountain View, Calif.
the microgravity environment of space. STS-37 with repeats of some experiments and some additional new experiments. processes and fluid sciences fields. provided by a R/IM in a Shuttle middeck locker position. remain outside the R/IM until BIMDA reconfiguration prior to reentry. determine the alignment of the blocks on each unit. the flight, using the needle/valve adaptors and sample vials. apparatus provides options for variations in the mixing of fluids. Shuttle caused by the interaction of atomic oxygen with the spacecraft. the spacecraft encounters atomic oxygen in orbit. Atlantis is in darkness, with crew cabin lights and cargo bay lights off. hours after launch, and the optical disks will be changed periodically. as an astronaut in May 1980.
on STS-33 from Nov. 22-27, 1989, a Department of Defense-dedicated mission. Blaha has logged a total of 239 hours in space. Shannon W. Lucid, 48, Ph.D., will serve as Mission Specialist 1 (MS1). and will be making her third space flight. and 1973, respectively, from the University of Oklahoma. instrument. Lucid has logged more than 290 hours in space. an astronaut in 1984, Low will be making his second space flight. astronautics from Stanford University in 1983.
mechanical arm. 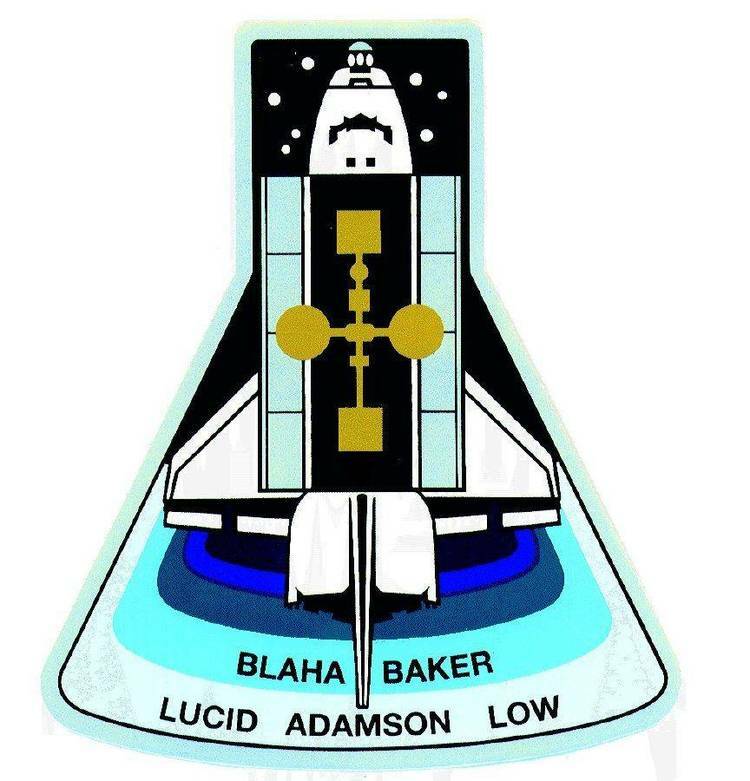 Low has logged more than 261 hours in space. James C. Adamson, 45, Col., USA, will serve as Mission Specialist 3 (MS3). considers Monarch, Mont., his hometown. aerospace engineering from Princeton University. Defense-dedicated mission. He has logged 121 hours in space. Kennedy Space Center, Kennedy Space Center, Fla.